Alice Sterk, age 90, of Grand Rapids, was called to her heavenly home on Friday evening, October 19, 2018. Alice loved music. She served as a church organist for 51 years and enjoyed playing the piano for her entire life. She was preceded in death by all her siblings, Gert DeGroot, Bill (Chris) DeGroot, Jessie (Casey) Sterk, and Louise (Don) Visser. 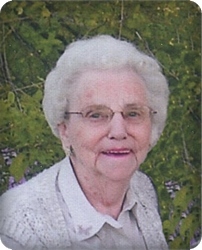 Alice will be lovingly remembered by her husband of 69 years, Joe; her children, David (Lois) Sterk, Kathleen (Dennis) Mishoe, Paul Sterk; grandchildren, Kimberly (Ben) DeVries, Brenda Sterk, D.J. (Jessie) Sterk, Bradley (Stephanie) Sterk, Daniel (Jennifer) Sterk, Holly (Travis) Weber, Lori Newman; 14 great grandchildren; sisters-in-law and brothers-in-law, Donna Sterk, Bill (Reet) Sterk, Shirley (Jim) Schipper, Ken (Joyce) Sterk, Betty (Bob) DeJong, Jeanette Visser; many nieces and nephews. The family will greet visitors on Monday, October 22, from 5 - 8 pm at Stroo Funeral Home and Tuesday, October 23, from 10 - 10:45 am prior to the service beginning at 11 am at Dutton United Reformed Church, 6950 Hanna Lake SE, with her pastor, Rev. Greg Lubbers, officiating. Interment will be in Blain Cemetery. Memorial contributions may be made to Covenant U.R.C. or Zion Christian School.